To celebrate the release of Warner Bros. Pictures and Legendary Pictures Pacific Rim on 3D™, Blu-ray™ and DVD on Nov 11, we’re giving you the chance to win your very own copy as well as Pacific Rim: Man, Machines and Monsters; an amazing book by director Guillermo Del Toro, which delves inside the inner workings of this epic film! When legions of monstrous alien creatures started rising from the sea, a deadly war began. To combat them, humans devised massive robots called Jaegers as weapons. But even the Jaegers proved nearly defenceless against the creatures. Now on the verge of defeat, mankind must turn to two unlikely heroes, teamed in a seemingly obsolete Jaeger, as the last hope against a mounting apocalypse. 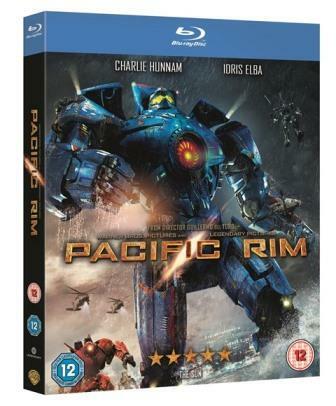 Pacific Rim is directed by Guillermo del Toro (Pan’s Labyrinth) and stars home-grown talent Charlie Hunnam (Sons of Anarchy) and Idris Elba (Thor), plus Rinko Kikuchi (Babel) and Charlie Day (Horrible Bosses), along with Rob Kazinsky, Max Martini, Clifton Collins Jr., Burn Gorman and Rob Perlman. 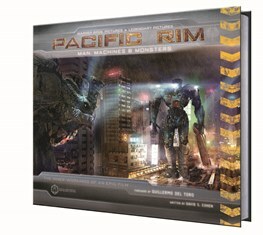 Pacific Rim: Man, Machines & Monsters chronicles the production of the film with stunning concept art, captivating photography, and cast and crew descriptions of the shoot. Featuring a foreword by Guillermo Del Toro! To be in with a chance of winning Pacific Rim on Blu-ray as well as one of these stunning books simply answer the question below. The competition closes at 23.59 on November 22nd 2013. Imagery taken from Pacific Rim: Man, Machines & Monsters, Titan Books © 2013 Legendary Entertainment Inc. All Rights Reserved. Pacific Rim Artwork © 2013 Warner Bros. Entertainment Inc. All rights reserved. Pacific Rim Photography © 2013 Warner Bros. Entertainment Inc. and Legendary Pictures Funding, LLC.